My driveway has a gate that automatically opens when you drive up, and then closes. Recently it stopped working and this blog post describes how I got the bugs out of the controller, reverse-engineered it, and got it working again. The gate is controlled by a Stanley 24600 gate controller, which has the fairly simple task of running the motors to open the gate and close the gate as appropriate. Everything worked fine for years, until one recent day it just stopped working, which was rather inconvenient. When I opened up the controller box, I noticed a couple potential problems. 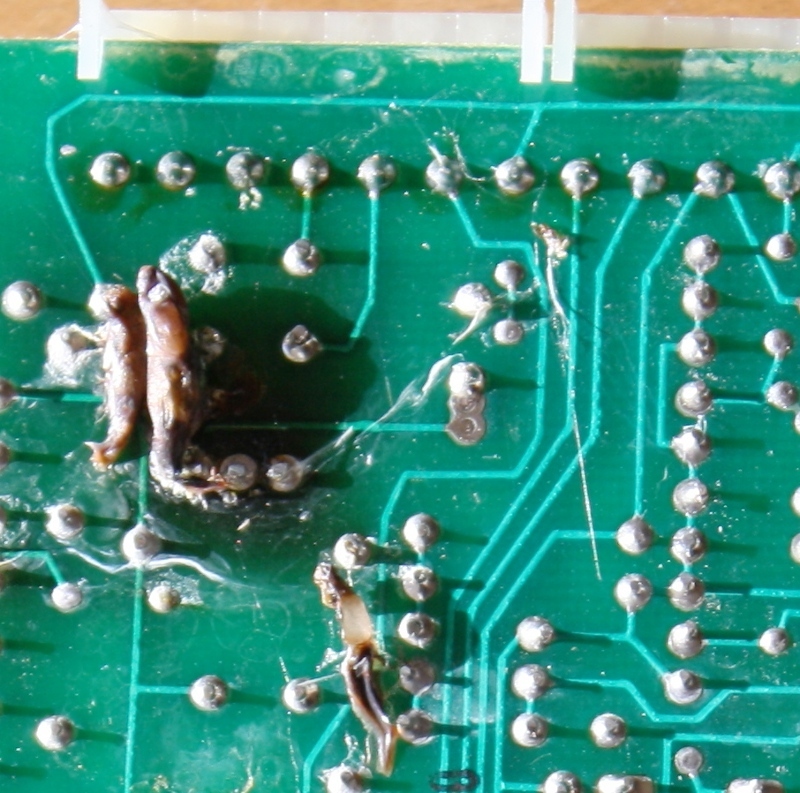 First, the circuit board had some disgusting cocoons on it, which were apparently shorting out the board and preventing it from working. I don't know what sort of insect made the cocoons, and I didn't want to wait around to find out. Getting rid of the ant nest was easy. Opening up the box scared the ants, and they scurried around and moved out in 15 minutes flat, taking the eggs with them. I replaced the weather stripping around the box to keep them out. The hideous cocoons on the other hand were a bigger problem. 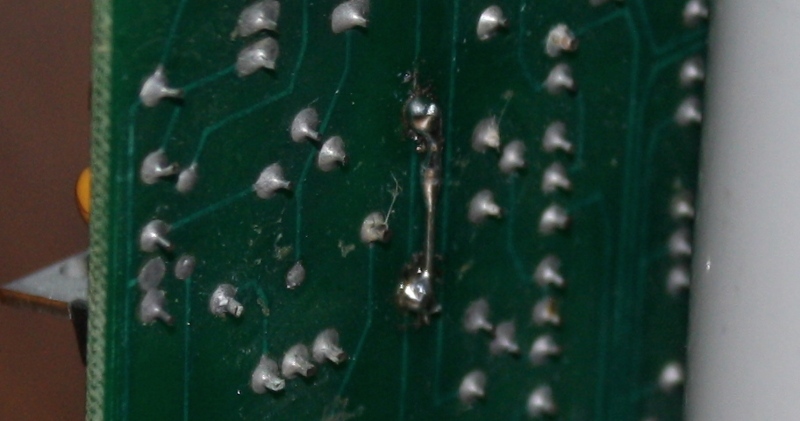 I removed them from the board and scrubbed the circuit board clean with rubbing alcohol. After replacing the circuit board, the gate would start opening but would not stop opening, which was a change but not really an improvement. Everything else checked out fine (power, fuses, sensors, motors), so I knew the problem had to be in the controller. Unfortunately the controller is obsolete and nobody makes replacements or has documentation, so I figured I better get it fixed. I started poking around the circuit boards to try to figure out how they worked and where the problem might be. The logic provided by the controller is simple, but not trivial: it can use a signal to open, or can use a signal to both open and close, or can use a signal to reverse, and has a stop signal. It also has a separate board to automatically close after a delay. 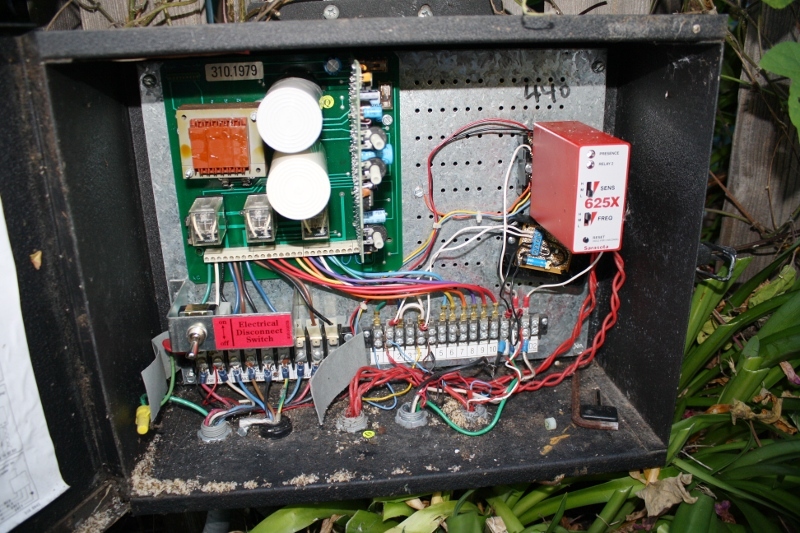 The controller is implemented using some CMOS gates and flip flops for the logic, and a couple 555 timers to control how long to run the motors to open and close the gates. 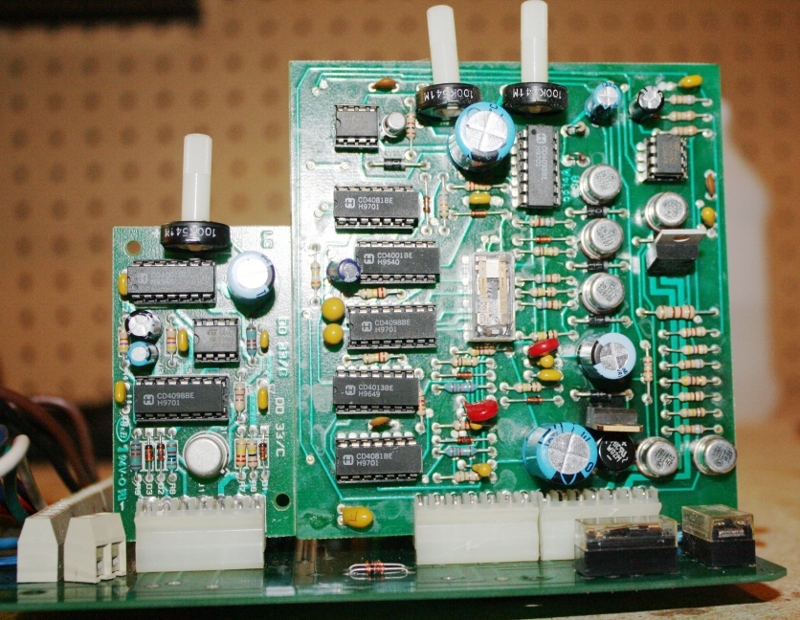 Three big relays and two giant capacitors control the motors, while a few small relays provide additional logic. The controller also has a handful of transistors for various functions, and a bunch of resistors, diodes, and capacitors. The board on the right is the main logic board, and the smaller board on the left provides the optional automatic-close function. Note the variable resistors (with long white shafts) to adjust the various timings. There's also an AC-to-DC circuit on the board to power the logic, and a triac to switch low-voltage AC on and off for reasons I never figured out. Newer controllers, of course, replace all this discrete logic with a microcontroller. They also provide a lot more functionality and options. It's interesting, though, to see how these circuits were implemented in the "olden days". I spent a bunch of time following PCB traces around (both visually and with a continuity tester) trying to figure out how all the pieces work together. It was a slower process than I had expected, since many of the traces go under components and you can't see where they end up. I was getting frustrated and considered building my own controller out of an Arduino, since it would be about 10 lines of code. However, I figured interfacing with the sensors and AC relays would be a pain, and I didn't want to burn out the expensive motors with a programming error. Thus, I continued to analyze the existing controller. Today, my gate would only close half-way. 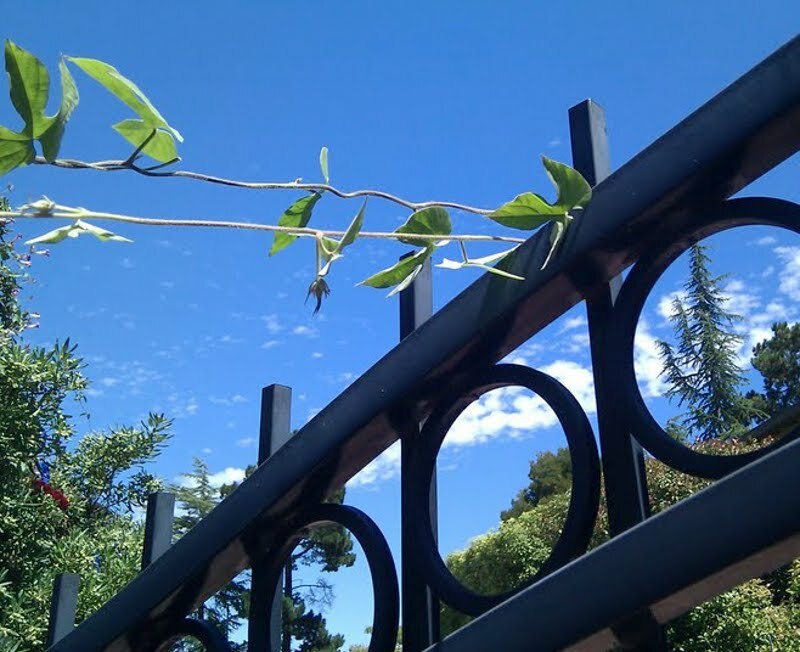 After some investigation, I discovered that a vine had somehow gotten caught on the gate, and it was strong enough to keep the gate from closing all the way. I was a bit surprised that the gate motors weren't strong enough to rip the vine off, but I guess as a safety feature they don't have a lot of extra force. This problem was a lot easier to fix than the previous, since I just needed to remove the vine. I conclude, however, that nature hates my gate and is trying to keep it from working, whether it takes insects or plants. What next? Ice storm? Tornado? Nice post, fun to read. TY. morningGlory is a persistent macro-organic virus. Efforts at irradication are often failures due to its quick maturity cycle and persistent self-replicating nature. The virus is hardened against common attacks (pruning, pulling), through a complex usage of weak nodal points, hardy tap-root systems, and a distributed point-of-rooting technique which utilizes "creeper vines." It has been seen in the wild disrupting gate-cycle operations, and often takes resources from tree functions. Technote: The seeds of some varieties are hallucinogenic. What kind of operator is this? Ewww... gives me chills! 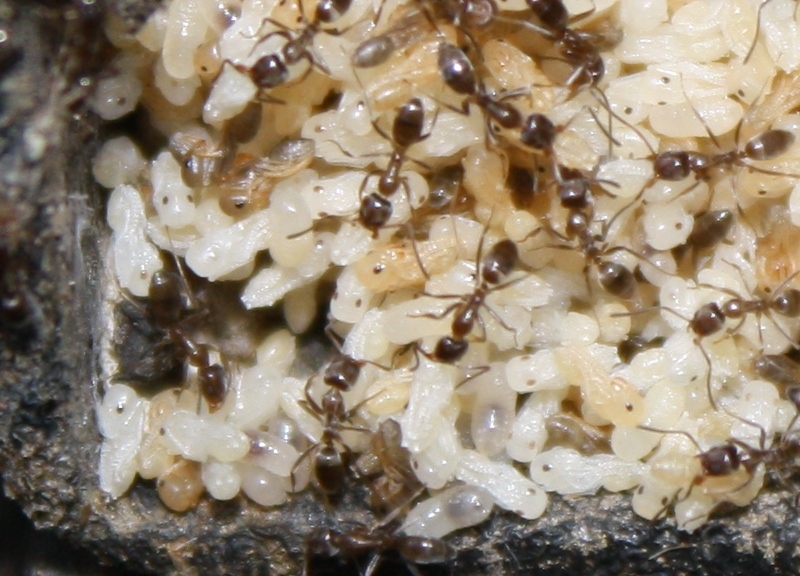 Those ants are so gross! They may have been attracted by the warmth. You seem to know quite a bit about driveway gates..... may be you can help me out. Our driveway has shifted on one side causing the non-hinged end to scrape on the concrete. We are going to get the bottom shaved off but apparently the extreme resistance from the dragging caused the resistor function to lock up or malfunction(according to the gate guy). So the gate currently won't move at all. he said it's any easy fix. We are pretty handy but I can't find any info on the web. Do you know anything about this?